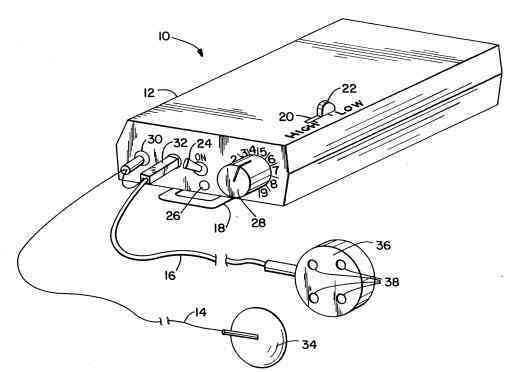 This project, a tens machine from 1989, shows how to design and build a transcutaneous electrical nerve stimulator machine. An improved transcutaneous electrical nerve stimulator (TENS) involving a microcurrent (typically 25 to 900 microamps) monophase D.C. carrier signal (typically 10,000 to 19,000 Hz, preferably 15,000 Hz) that is modulated on and off in time (typically at 0.3 Hz up to 10,000 Hz, preferably 9.125 Hz followed by 292 Hz) and further inverted about every second by reversing the polarity of the signal at the electrodes. Such a device has been found to be useful in alleviating pain very rapidly. This design relates to an improved transcutaneous electrical nerve stimulation (TENS) apparatus for symptomatic relief and management of chronic (long term) intractable pain and adjunctive treatment in the management of postsurgical traumatic acute pain. More specifically, the design relates to a TENS device that operates in the electrical current range of about 25 microamps to less than 1 milliamp using a chopped (e.g., 9.125 Hz or 292 Hz) carrier frequency (e.g., 15,000 Hz) having typically a monophasic wave profile which is preferably inverted (reversed polarity) approximately every second. The improved transcutaneous electrical nerve stimulator according to the present design is categorically a microcurrent TENS which operates using a unique wave form. The instrument is constructed such that it will operate from about 25 microamps up to about 900 microamps current during therapeutic use with a peak current of the order of 6 milliamps. Typically the current is applied through a pair of electrodes in the form of a high frequency, monophasic, burst of a D.C. carrier signal (e.g., at lest 10,000 Hz to 19,000 Hz)that is chopped or modulated at a relatively lower frequency (e.g., from about 0.3 Hz up to 10,000 Hz). The burst of the modulated carrier signal are typically from about 0.05 seconds to about 10 seconds in duration with about one second in duration being preferred. Preferably, successive bursts are inverted relative to the previous burst by reversing the polarity at the electrodes thus simulating a biphasic wave form, yet the carrier is a monophasic D.C. signal. Preferably, the modulating frequency is selected from pairs of frequencies which exhibit specific therapeutic action (e.g., 292 Hz and 9.125 Hz). Advantageously the TENS can be performed synchronously with light stimulation and has been found to relieve pain extremely fast (typically in 1 to 3 minutes) under conditions that are below the level of human sensation. (b) an electrical circuit means for supplying to the pair of electrode means from about 25 microamps up to about 900 microamps of a monophasic sequence of bursts of a D.C. carrier signal selected from the frequency range of at least 10,000 Hz to about 19,000 Hz which is modulated on and off in time at a frequency selected from the range of about 0.3 Hz up to 10,000 Hz and said bursts are characterized as having a periodicity greater in duration than that associated with the modulation frequency. Preferably the microcurrent TENS device inverts the D.C. carrier signal between bursts by reversing the polarity at the pair of electrodes means. Most preferably this occurs about every second with the modulating frequency being selected from the group consisting of 9.125, 18.25, 73, 146, 292, 584, 168, 2336, and 4672 Hz with a D.C. carrier frequency of typically 15,000 Hz. For routine pain management the use of 9.125 Hz followed by 292 Hz is particularly useful. The present design also provides a unique LED electrode that produces electromagnetic radiation synchronously with the electrical current therapy. The improved microcurrent transcutaneous electrical nerve stimulator according to the present design, how it operates and how it is used, how it differs from previously known instruments and the advantages of using the improved device can perhaps be best explained and understood by reference to the drawings. FIG. 1 illustrates one particularly preferred embodiment of the present design wherein the TENS unit (generally designated by the numeral 10) consists of a portable housing 12 with two external electrodes 14 and 16. In this particular embodiment the case or housing 12 is equipped with a clip 18 that allows the unit to be worn on the belt or the like during use. The other side of the case 12 relative to the belt clip 18 is equipped with a slot 20 that allows a sliding selector switch 22 to be used to set the beat frequency (i.e., the modulating frequency for turning the carrier signal on and off at a predetermined frequency characteristic of the therapeutic treatment being performed). In this particular illustrated embodiment only two frequency settings are available to the user (typically 9.125 Hz or 292 Hz). As such this particular embodiment is easily operated by the patient. In a more complex embodiment, a greater number of preselected discrete frequency settings are provided (for example, by making the slot 20 of the sliding selector switch 22 longer) thus producing a clinical or physician's version of the instrument. The top face of the case 12 is further provided with an on/off switch 24 and a monitor light 26 along with an electrical current selector switch 28. 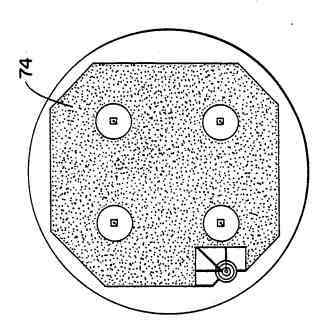 Also there are two electrode connector terminals 30 and 32 provided on the top face of the case 12 which in this illustrated embodiment involve two separate types of energy emitting electrode systems. The first system involves two electrically conductive electrodes 34 and 36. Electrode 34 is a conventional self adhering neurostimulation electrode which is adhesively pressed to the skin or the like. The second current electrode 36 is a conductive pad that represents the outer skin contacting surface of both the second electrical current electrode and the light emitting diode (LED) system (the second type of energy emitting electrode system). As shown in FIG. 1, there is a set of four light emitting diodes 38 protruding through the current carrying electrode surface 36. Thus, in this particular embodiment, both the unique electrical wave form of the present design and synchronous light radiation can be simultaneously applied transcutaneously at the same physical location. Typically this second electrode 36 is held adhesively to the skin or the like during use by the use of a transparent, conductive, double adhesive electrode patch (not shown). The actual use of the TENS unit 10 illustrated in FIG. 1 is relatively simple and straightforward. The electrodes, typically either a pair of self adhering neurostimulation electrodes of approximately 32 millimeters in diameter such as supplied by Axelgaard Manufacturing Co. of Fallbrook, Calif., or one such electrode plus the specialized light/current electrode of FIG. 1 adhesively held by a 38.4 millimeter in diameter model 4.times.4sp electrode patch supplied by AcuData Software Medical Products Division of Petaluma, Calif., are positioned on mammalian skin tissue in accordance with a health care professional or physician's instructions. During use there are only two adjustments that need to be made. The current selector switch 28 on the top face of the housing 12 can be adjusted from 25 microamps up to a 6 milliamp peak output. The frequency selector 22 can be positioned wither high, e.g. 292 Hz, or low, e.g. 9.125 Hz. The on/off switch 24 when turned on will activate the on light 26 which flashes or blinks faster as the current setting is increased. As such, visual confirmation of the instrument being on and the particular current setting can be readily determined by looking at the light 26. During use the current can be adjusted by the user by use of switch 28. Typically the current is initially elevated until the perception of electrical stimulation is perceived. The current is then decreased until perception of stimulation is undetectable. Readjustment during treatment can be repeated as needed. Typically a setting of about three tenths of full scale for switch 28 represents an optimum effective setting. One particularly preferred method of use for pain involving muscle spasms, tightness or chronic problems, starts with 9.125 Hz and the current turned up until it can be felt. The current setting is then lowered until the sensation is gone. The current is continuously lowered each time the sensation of stimulation becomes apparent until a setting is found where no further sensation appears for two minutes. The TENS unit is then switched to the high frequency setting. For acute pain such as post surgical pain or pain involving inflammation and/or swelling rather than muscle tightness or spasm, start with 292 Hz. Such procedures have been found to alleviate pain in as little as 1 to 3 minutes. Application of the TENS unit for periods in excess of twenty minutes is not generally needed although longer or even continual stimulation may be beneficial in selected cases. FIG. 2 is a block diagram of the individual components making up a typical electrical circuit for the embodiment of the TENS device shown in FIG. 1. The respective function of the individual components are indicated on the block diagram. 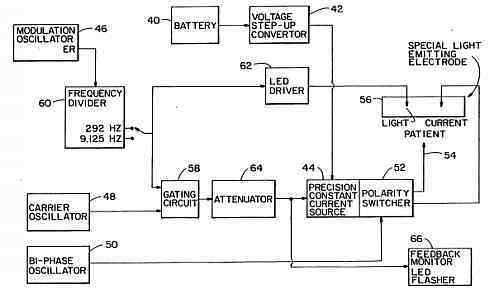 As shown, the device is powered by a battery 40 supplying current to a voltage step-up converter 42. The voltage step-up converter typically produces a 30 volt source which is part of a precision constant current source 44 (for details see FIG. 2). The 30 volt is applied to the skin and a precision constant current sync regulates the current through the skin. As further illustrated on the left side of FIG. 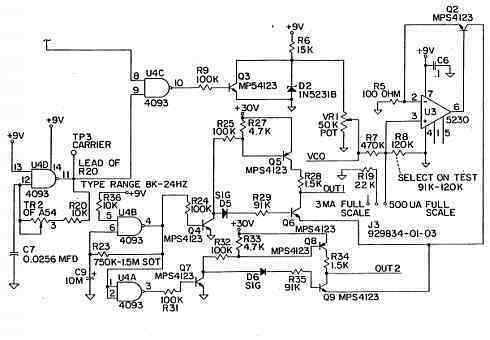 2, the electrical circuit involves a modulation oscillator 46, a carrier oscillator 48 and a bi-phase oscillator 50. The bi-phase oscillator 50 is typically a 0.05 second to 10 second oscillator that drives a polarity switcher 52 which in turn reverses the polarity of the current supplied by the precision constant current source 44 at the current electrodes 54 and 56. 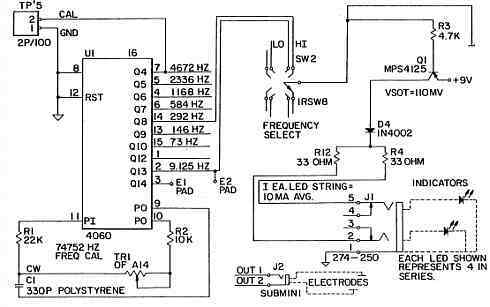 The carrier oscillator 48 is typically a 10,000 Hz to 19,000 Hz signal (preferably about 15,000 Hz) generator that drives one of the input sides of the gating circuit 58. The modulation oscillator 46 and frequency divider 60 are the source of the beat frequency that chops the carrier frequency on and off in time at preselected frequencies known to be beneficial for therapeutic purposes. As suggested in FIG. 2, the output from the frequency divider 60 is either 292 Hz or 9.125 Hz. 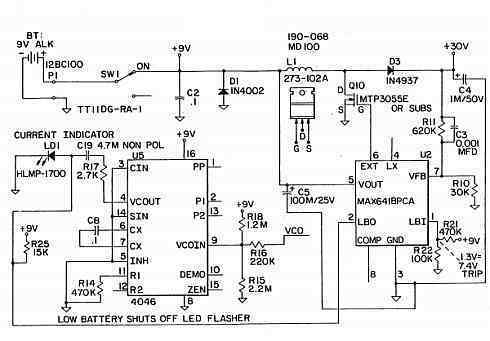 This signal drives both the LED driver 62 and the other input side of the gating circuit 58. The LED driver 62 then drives the LED electrode 64 at the selected frequency synchronously with the current electrodes 54 and 56. The gating circuit 58 output is directed through attenuator 64 before the signal is directed to the precision constant current source 44 and polarity switcher 52. The output from the attenuator is also used to drive the feedback monitor LED flasher 66 thus alerting the patient that the TENS device is operating by flashing at a rate proportional to the current. FIG. 3A, FIG. 3AB, and FIG. 3B show a detailed schematic of one preferred embodiment of the electrical circuitry according to the present design. This particular circuitry is generic to both the 292 Hz/9.125 Hz modulated embodiment of FIGS. 1 and 2 as sell as the physician's version having eight different selectable modulation frequencies. In presenting the schematic of FIG. 3, conventional electrical notation is employed to identify all components and relevant electrical component values. A single 9 volt portable radio type battery is employed as the current source. The following table of components categorizes and identifies the individual elements and associated circuitry corresponding to the functional block circuit description of FIG. 2. FIG. 4 illustrates the essential features of the unique wave form of the electrical signal employed in the improved TENS according to the present design. As illustrated the vertical axis is D.C. current wherein the center line represents ground and the displacement upwards represents one polarity and displacement downward represents the inverse or reverse polarity at the pair of conductive electrodes. The horizontal axis is time. As seen in FIG. 4, the instantaneous current at maximum power is plotted as a function of time with insufficient resolution to perceive the carrier frequency (i.e., typically 15,000 Hz). What can be clearly seen is the inversion or more specifically the reversing of polarity at the electrode approximately every second in this specific illustration. Also, the monophasic character of the D.C. carrier signal is evident in that during any given one second burst of the 15,000 Hz carrier signal, current flows in only one direction (i.e., amplitude either above or below the center ground but not both). The on/off time modulation of the carrier signal at 9.125 Hz is suggested in that a sequence of 110 millisecond bursts chops the one second interval into approximately 9 cycles with approximately 50% duty cycle (i.e., current transmission during half of the cycle). In the case of 292 Hz a 3.4 millisecond burst chops the one second into 292 cycles. As further suggested in the first reversed polarity modulation cycle a burst of the 15,000 Hz carrier frequency would represent some 822 individual pulses within a given duty cycle at 9.125 Hz or 25.7 individual pulses, at 292 Hz. As further suggested in FIG. 4, the normal treatment range is confined to a current of up to about 900 microamps which is represented in the drawing as a central band well below the maximum current amplitude of 6 milliamps. It should be appreciated that the illustration of FIGS. 4 and 5 are not to scale and will vary depending on the selection and rate of polarity reversal at the electrodes. FIGS. 5a and 5b illustrate the printed circuit associated with the novel combined LED/current electrode according to the present design. As illustrated in FIG. 5a, the back side of the printed circuit involves leads 68 and 70 which connect fours LED's (not shown) in series. The other leads 72 supply current to the tissue contacting current electrode 74 of FIG. 5b. 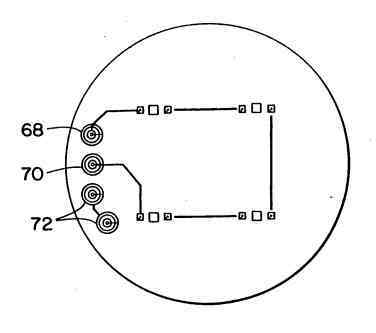 Current electrode 74 is provided with four openings for insertion of the LED's into the light emitting circuitry 68 and 70. This circuit board is then incorporated into an appropriate housing as illustrated in FIG. 1. The advantages of the improved TENS unit according to the present design are viewed as being numerous and significant. The fact that the unit is a microcurrent TENS powered by a single 9 volt battery means the unit is highly portable, readily serviceable and safe under all normal operating conditions. The fact that the polarity at the electrodes is systematically reversed reduces the likelihood of any detrimental tissue damage in the vicinity of the electrodes. In this regard reversal of polarity every 0.05 seconds up to about 10 seconds (preferably from about 0.1 seconds to 8 seconds and most preferably about every second) is useful for purposes of this design but other periodical reversal schemes including asynchronous, random and-or time delayed or interruption of the carrier signal should be considered equivalent. The unique wave profile results in extremely fast management of pain under treatment conditions that are virtually undetectable to the user. And, the overall therapeutic procedure is highly compatible with simultaneous treatment using IR and near IR pulsed therapy again accelerating the process of pain management. Having thus described and exemplified the preferred embodiments with a certain degree of particularity, it is to be understood that the design is not to be limited to the embodiments set forth herein for purposes of exemplification, but is to be limited only by the scope of the attached claims, including a full range of equivalents to which each element thereof is entitled.